In this week’s episode of the profit, Marcus Lemonis visits Pro-Fit Results, the fitness studio of personal trainers Michael and Tina Sena. It’s a small personalized training fitness studio located in Dyre Indiana. Michael and Tina are very passionate about fitness and the passion shows in the business. The problem is that the financial aspect of the business is not up to par and Michael and Tina would love Marcus Lemonis to come help out. As the episode starts, we find out that Michael, a 30-year fitness veteran and former bodybuilder, has quite an ego and really wants to do things himself and on his own terms leaving his wife to follow. He calls this “the Michael Sena show“. Even though Tina, his wife, is a 50-50 owner in the business, Michael doesn’t want to put her name on the business merchandising and logos. It’s all about Michael in Pro-Fit. This is straining his relationship with his wife Tina who is also a long-term fitness trainer and former bodybuilder herself. So it’s up to Marcus Lemonis to find a way to expand the business, increase revenue and finally generates a healthy profit for the business. Michael and Tina Sena created Pro-Fit five years ago with $75,000 which was their entire life-saving at the time. Even with four employees, Pro-Fit drains a lot of their time and keeps them from spending time with their daughter Mia. Marcus Lemonis believes that with the passion of Tina and Michael, their extensive fitness background and confidence, he can take the business up to becoming in national brand and one of the biggest fitness franchises in America. If you’re a fan of the profit, you will notice a pattern here. Marcus always goes big and always tries to expand the business nationwide with a franchise model. As soon as Marcus Lemonis lands in the Pro-Fit Gym and meets Michael Sena, he finds out that according to Michael, Pro-Fit is not a gym, it’s a personalized fitness center where each member is focused on. 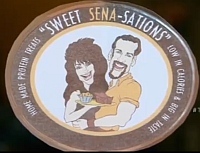 Marcus also finds out that Michaels’ wife Tina, has a line of gluten-free high protein bars called “Sweet Sena-Sations“. We find out that Michael has a very unique style to fitness and his Pro-Fit Gym has very few specific equipments, so specific that even his wife Tina has to go and work out in other gyms if she wanted to practice other types of exercises. Again, Michael reminds Marcus that it’s HIS name and not his wife’s name that is recognised publicly and that this is the reason why Tina doesn’t have a name on the business logos and merchandising. Marcus Lemonis also finds out that the gym is closed for many hours a day due to lack of classes and this is hurting the business. If they could fill those hours with classes then the revenue can come up almost 50% per day. Tina invites Marcus to sample some of her “Sweet Sena-Sations protein bars” and explains to him how she came up with the recipe. Marcus believes that by focusing on these “Sweet Sena-Sations” protein bars and bites, the Pro-Fit gym can increase revenue dramatically. Michael interrupts the discussion between them and offers Marcus to join in the class and work out, he thinks Marcus is a softy and wants to see how good he would stand in one of his fitness training sessions. Marcus agrees and tells him he worked out last that morning and gets ready to join the class. Marcus performs very well in the training session and Michael tells him “he has some potential” to which Marcus replies “so does your business”. He gets dressed and they meet to talk about business. Incredibly, “Macho Michael” tells Marcus the need to talk about the business as numbers man-to-man and that Tina doesn’t need to be there. Marcus replies by telling Tina is also a 50 percent owner of the business and that she needs to stay. She agrees and we find out that Michael is keeping his wife in the dark when it comes to specific business numbers because “she doesn’t really need to know them”. Michael goes ahead and tells Marcus in front of his wife that last year they made $50,000 profit from $429,000 revenue. Judging by the face Tina makes on hearing this, it looks like Michael may have told her something less before. Marcus takes Michael aside and Michael breaks down and cries. He knows he’s failing in the business and needs help. He then goes on and calls Marcus “Oprah“, because he made him cry. The location of the gym is in a very dry shopping centre area with little traffic. Very few lessons due to Michael’s hands-on training system. Michaels’ ego and he’s overall total control of the business. Since this is a business that is not really on the verge of collapse, Marcus asks Michael and Tina what exactly they want from him. Michael Sten says he has to make a first offer and that offer will be for Tinas’ “Sweet Sena-Sations” protein line of products. He wants the deal to be outside of the Pro-Fit business deal this way Tina can be her own entreprenuer with her own line of products, her own accounts, her own brand with her face on the product and a deal from Marcus. Marcus offers Tina $50,000 for 50% of the business but he will provide the working capital, the employees, the facilities for production. Michael jumps in and you can feel he was to take control of this deal which has nothing to do with him. Tina thinks about it for a few minutes and agrees and the deal is done. Michael asks Marcus what about his offer and his deal. Marcus tells Michael he doesn’t believe in the single location business model, he offers Michael $250,000 for 75% of the business but this is contingent on moving to a bigger location with other training equipment and exercise material available so that they can expand the reach to order types of clients with other types of needs. Michael replies to Marcus was that he has a contractual lease agreement for another three years for the current location that he believes he can’t get out of. Marcus tells Michael that he needs to figure out a way to get out of the lease because he’s interested in moving to a bigger location where there will be much more traffic. Michael says that he has always owned hundred percent of everything but after thinking about it for a couple of minutes he agrees and he and Marcus shake hands. So in this episode Marcus makes two deals and tells Tina that she would have to work exclusively on the food line while Michael will have to work exclusively on the fitness line. Michael will need to give up control and be open to change. Pro-Fit gym has to move to a bigger location. New equipment has to be pricing to cater for all other types of clients interested in working out in different ways. Marcus intends to do with the new state-of-the-art facility that is going to become a one-stop shop for all kinds of fitness activities. Everything from spinning to yoga to group session training to life style coaching to diet advice will all be catered for. The new facility will also have a healthy cafe and bakery as well as a cold pressed juice bar. This will greatly improve the brand and will create a business that is scalable and expandable to the rest of the country. The deal also includes Tina which gets $50,000 for a 50% share in her protein bites/bars and snacks business. Marcus intends to have the protein bar in a major grocery retailer. This will require standardised production to be able to meet demand. In the next scene Michael complains about the fact that Marcus will take control of the business and says that due to his personal accomplishments this deal needs to have a bigger dog bowl than Marcus. Marcus takes Michael to see the new 20,000 ft. facility which is much bigger than the current one Pro-Fit is located at. This is in line with his expansion ideas for the Pro-Fit business. Michael is very scared and tells Marcus was that the space is just too big and the cost will be astronomical. Marcus replies that the bigger the space and the more facilities and services it provide the bigger the revenue but Michael looks quite scared to expand his business this far. He tells Michael to put his big boy pants on. Next Marcus brings in Erica and Jeff from his ad agency to pitch Tina some new packaging for the Sweet Sena-Sations protein bites line. Erica and Jeff comes up with a new packaging for a bite-size version of the sweet sena-sations. Michael cant keep himself from coming to see what’s up and interrupts the meeting once again he feels left out and wants to take control. He still has to get out of the lease but seem to be doing nothing about it. Next, Marcus takes Michael to Chicago Home fitness to check out some fitness equipment for the new facility but Michael is still feeling the weight of being left out of the deal Marcus made with Tina. He also feels not all ready to expand the business this way. He tells Marcus that he opened Pro-Fit to keep it small and focused on a smaller clientele. Marcus tells Michael that he needs to start thinking differently and in the much bigger way if he wants to make money with this business. He reminds Michael that if they add new equipment and have much more space and services, the revenue will increase proportionally and Pro-Fit will finally be able attract new customers and make a good profit for its owners. Michael agrees so they go on a shopping spree for fitness equipment. They spend around $58,904 and again Marcus seems to pay with something that looks like a “Black card“. The next scene shows Marcus being excited about starting up production of Tinas’ Sweet Sena-Sations protein snacks line. He takes her to Rose’s bakery, the gluten-free bakery owned by Marcus in Chicago. By meeting the chefs at Roses bakery, Tina will be able to learn how to mass-produce her products in a standardized way to be able to meet production figures for when they get into a grocery store. Again, Tina is accompanied by Michael. He still needs to get out of his rent lease but seems to be much more interested in seeing what happens to his wife’s deal rather than taking care of he’s own deal. Tina and Michael have a huge heated discussion about her future and her involvement in his business in which she tells him that she’s had enough with him controlling everything. Now that she has her own business to look after, he needs to work with her and encourage her rather than try to impose his control on her. She wants to have her own identity and a say in the business. It all comes down to the fact that Michael is jealous of the success of his wife. Michael finally meets with his lawyer to see if it’s possible to get out of the lease. His lawyer tells him that the lease is air tight and landlord friendly. He doesn’t see any way out of it is. Since the deal with Marcus was contingent on this (getting out of the lease), it looks like the deal would go through. Michael calls Marcus into his office and tells him that he is not in the position of getting the lease. Marcus is not happy and believes that Michael didn’t put as much effort into getting the lease because he wasn’t really interested in making the deal with Marcus in the first place. He tells Michael that the deal is off with him. The next scene cuts to Michael and Tina having a conversation in which Michael apologises to Tina for all the years of trying to control her and for sticking his head into her own part of the deal instead of making an effort with his own part. His apology seems very sincere and she forgives him. It looks like Michael is just not words because in the very next scene he goes ahead and changes the merchandising and logos of Pro-Fit to include Tina’s name and surprises her with this. Marcus is so impressed with this change of heart and decides to make a smaller deal with Michael. He will give Michael the money he needs to grow the business in their current location,together they will perfect the model and when they are ready, they will take it nationwide. Michael agrees and work starts immediately to renovate the current location to create a more floor space for extra fitness activities. So in come the builders. Marcus claims that the renovation to the current Pro-Fit location will cost more than $100,000 and it will be worth every penny. There will be a new court press juice bar so customers can grab a healthy beverage while working out in the gym. There will also be extra rooms for for other activities like yoga, spinning, massages and pilates. This will enable customers to take more classes and generate more revenue for the business. One week later, Marcus Lemonis visits the Pro-Fit gym and finds out that Michael has changed the layout agreed on for the renovations without consulting first with Marcus. It looks like dejavu all over again. in the end they both find a way to look at the positive aspects of it. Meanwhile Marcus and Tina visit the grocery store Mariano’s to pitch the Sweet Sena-Sations protein bites. The buyer for Mariano’s likes the product and the fact that it has no protein after taste. He decides to make an exclusive deal with Tina for sweet sena-sations. So Tina gets an order of 3000 packages from the Mariano’s grocery store. Tina stands to make about $7000 from just this first order and things are looking good for her and Marcus. Marcus checks back with Michael at the Pro-Fit gym and sees that business is booming for Pro-Fit. The gym has signed up over 100 new members and there are now newly hired instructors to take on those classes throughout the day. Michael and Tina’s relationship now looks strengthened and in the future looks very bright for the family and Pro-Fit. We hope all continues to go well with the business and are looking forward to updates which we will bring to you as soon as we get them. I hope you enjoyed our review of this episode, there was a lot of drama but it all ended well and this is what we like to see. Don’t forget to retweet this post, like us on Facebook and most importantly share your opinion and comments on this episode and its characters in the comment section below. hello I would like to know from where i can get tina’s protein bites? I just called the company and the protein bars will be in stores like Costco, GNC, Walgreens in about 3 to 4 months they said. Because the production still going. I just saw this episode last night. I would love to try the protein brownie bites. Where can they be purchased? When doing a Search for sweet Sena-sations the only page actually about the protein bars was a abandoned Registered TM of the old logo and funny that the register was let’s all guess who registered Tina’s work oh yes says the business is her’s for liability but her husband is the owner of her logo and company name. Been researching him for a possible interview and I read in an Inc. profile that he doesn’t invest in businesses that are good and don’t need his expertise and he doesn’t invest in new businesses/start ups either. Good morning Mr. Lemonis, I would like if possible for Mr. Lemonis to get in contact with me in a business Idea that I have for troubled teens that can help them advance in life, as well as their education. (Love the show and wish you the best). Glad this show is on the air. A BILLIONAIRE has come along to help improve your business model and revenue, & you don’t want to cooperate?!! Yes, Michael did act like he was jealous of Marcus’ interest in marketing his wife’s protein snacks, & he knows good & well he didn’t work hard to find a way out of that lease. Michael even interfered with Marcus’ remodeling model for their current site. I wonder how Michael & Tina’s gym is faring these days??? Take your lazy a## back up to the top of the page and read or click the link to their gym and wonder no more ! Tina can do a lot better than a man who diminishes her and her success. When Michael mocked her for thinking she was the Martha Stewart of fitness I almost fell of my couch. She handled herself with grace and class. Tina, don’t ever let a man hold you back. If he gets in the way of your shine, leave him behind! Well put Danielle you hit the nail on the head about Michael. If I was Tina I would get rid of that a’sshole. Pretty obvious he is on steroids and all those years of juicing for bodybuilding has really screwed him up. I think he has underlying manhood problems which is common problem with current and former steroid abusers because all those steroids shrink their nuts into raisins. before you post this information. Deja vu…and there are accent marks thst go along with this French saying. ..not dejavu! He does not have much equipment is correct English! Just an FYI! Otherwise…a good site! Bonnie. Check your own spelling!!!!!!!!!!!!!!!!!! Michael is jerk of a husband. How did someone as nice as her get stuck with him? Let her have her food business. Gawd. I started a stock market investment business and it is going down. Please help my rescue the buisness sooner possible. Tina is an absolute Goddess… and sweet… get rid of him..
Hi. I can’t find Tina’s Protein Bites. a store where they are sold? GNC just sold me a FIT bar and told me it was from The ProFit. That they changed their name and wrapping. Is this correct? If not, what the real story? Does anyone knows the name of the advertising agency they talk about in this episode?, Thanks.